Seen this pic of the Honda City Adventure that is suppose to be released as a 2017 model. Spotted being tested in Rome. No final word on engine size other then it is may a 750cc. Looks real cool !! I do hope they keep the seat height reasonable so inseam-challenged riders can get on and off safely. I prefer the Bulldog concept bike they brought out last year, but it doesn't seem to have made it into production. Does one need 750cc to have an adventure in the city? It is claimed it will have off-road capabilities. Yeah! If your adventure is out running bad guys like in the Bourne Legacy or testing the cycling abilities of the local gendarmes! For empty lots in the urban jungle, no doubt. might be a nice bike, but it has not got the characteristics that I like on the SW. This is not a step through anymore; it will have higher seat since it has bigger wheels;don't like chain drive; less storage capacity . This is just like Aprilia's 850 half scooter, half bike. 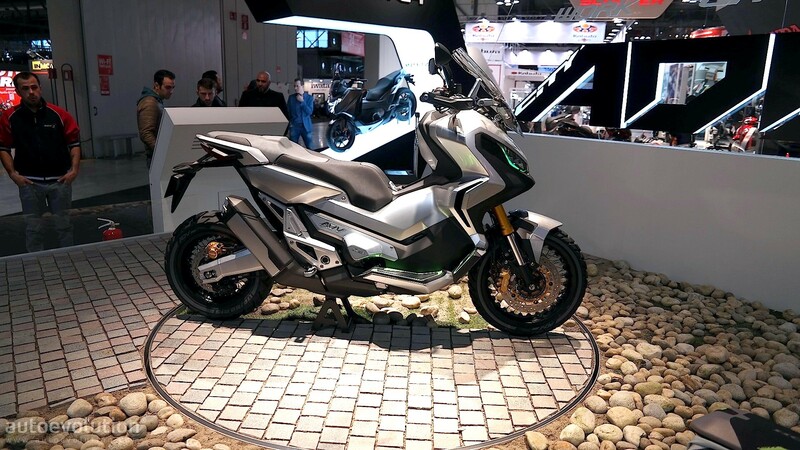 Looks like it may have the NC750 drivetrain. To me it's just an Adventure styled Integra with chunky tyres for Sunday poseurs who hang round biker cafés and greasy spoons. Not my cup of tea for sure. I really don't like these new Hondas with their angular design. To me the SW is one of the best looking of the maxis. My GT's styling isn't something I really like. I've gotten used to it but it doesn't look as good as the SW. The B650 I had kinda reminded me of a beached whale, it would have helped if mine hadn't been white. Would that the Integra were here in North American so that we could appreciate your opinion. From the front it also looks like a chubby Gilera Runner 125 scooter, do you have small capacity Gilera scooters in North America? Looks like something "RoboCop" would ride, not my idea of a smooth lines bike. AFAIK They were never marketed in the States. I have seen a few mentions of gray-market Runners and Dragsters coming in but, given that they are two strokes, I don't know if/how they were street-legal licensed. The angular street-fighter shapes of the City Adventure sure wouldn't work well with the "rotund" & aging demographic of maxi-scooter riders here in North America, but would certainly catch the eye of the Corner Boys. In the real world the vast majority of adventure bikes and their riders don't venture off road either. If it is going to use the NC750 drivetrain than it won't have a typical scooter clutch. It will use the NC750's DTC transmission. As explained " DCT features six gears, just like most other bikes, and gives a throttle response just as direct. There's an automatic box and two clutches. One clutch is responsible for odd gears, the other even. As one disengages first, the other instantaneously engages second, and so on." It can also be shifted manually with a push button. There's plenty of Honda motorcycles that you can now get with Dual Clutch Transmissions, they're a popular choice for British riders with Auto Only Licences who can ride these push button Honda's. Like I said earlier it seems to be a tarted up Integra. Not my cup of tea as you blokes say on the other side. I do not personally like the sharp lines at all. My two cents. It just dawned on me that both Honda and BMW are pointing maxi scooters at cities. That new Honda being designated a 'City Adventure' vehicle and the BMW C650 Sport and GT being designated an 'Urban Mobility' vehicle. Seems odd when a smaller 150-300cc scooter would better for most cities. I guess they're thinking about freeway travel as well as city centers. It's apparent that both companies think you need oddly shaped scooters for urban use. My GT's bizarre appearance isn't as appealing a design to look at as the SW and that Honda is even worse. The idea of a very comfortable bike- the s/w- with the capability to go further afield is very attractive. I took a peak at the aprilla 850 and ,from a limited picture, looked too bikish to me. Doesn't being able to not depend so much on roads appeal to anyone else? Will definetly check it out and any other similar style dirt bike scoots that you could steer my way. Check out the beefy handguards: great for knocking off the side mirrors on offending lane intruders !!!! I think it is a matter of ' horses for courses' . You will never find a car, motorcycle or scooter that can do it all well. For me the East German MZ TS250 Supa 5 and ETZ 250/300 2-strokes did it all well. They were inexpensive to run and maintain, the chain was fully enclosed and easy to adjust, both wheels could be removed in a few minutes, the rear shocks had only two settings, the front forks had rubber gaiters, there was no vulnerable plastic, the switches and fuses were basic, all bulbs were easy to change, and the lights were pretty good even on the 6v Supa 5. You could load them up like a pack horse and ride them comfortably all day on all types of roads. I went touring and to rallies on them at home and abroad. They were a good winter bike, and got me to work in all sorts of weather conditions for over 20 years, and had a very good club the MZ Riders Club which is still on the go. I lost interest in bikes when I got into maxi scooters almost 20 years ago and my last MZ then sat neglected in my garage for 15 years until I sold it when I moved house. I'm not nostalgic for the long gone East German marque ( Even though I once turned up at their factory in Zschopau and had to get permission to take photos outside) and don't want another, but those tough little 2-strokes could really do it all. The club name summed it up, MZ riders, not owners like most of the other posing and polishing clubs. Agree with you, but must say that my Subaru is comfortable, gets good gas mileage, has tons of hauling capacity, is good in snow, and has enough off-road capability to meet my needs. I've had it longer than any previous car; 6+ years now when I used to trade every year or two. Back to the scooter. The new Honda is almost surely targeted at a younger demographic than the one on this list. I, too, think it's too angular. My 14 y.o. daughter, though, actually prefers a Vespa-like styling but will not turn down the PCX when she gets her scooter licence later this year. Hmmm... Doesn't do a lot for me either. Like others have said, I find it too angular and just plain daft. Why is the exhaust pointing up towards the sky? Those 'offload' tyres are just for show too surely? I wonder how many owners will replace them with the same when the time comes - I bet most will just switch to regular tyres which are bound to be cheaper. It's nice to see that Honda aren't afraid to try different things but this sort of 'ruggedised' Integra isn't for me. How come nobodies said anything about the black Honda in the background mounted at an angle? It's a 750 Integra, Honda made a few changes to it for 2016. Probably because no one in the US can see one at a dealer since they aren't sold here.